What Different Types of Roulette Bets Are There? - Casino Answers! 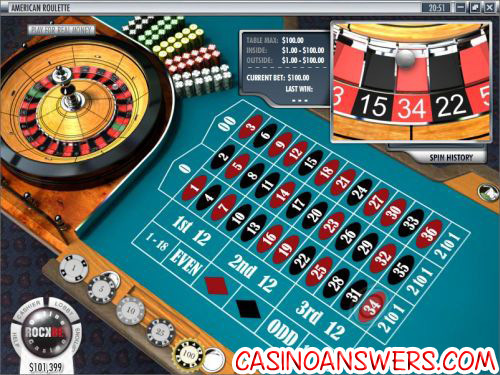 Casino Answers » Roulette » What Different Types of Roulette Bets Are There? What Different Types of Roulette Bets Are There? Roulette is a very popular game at casinos, and a large reason for it is all the betting options. Roulette is a very simple game to play, and it’s not one that you need to remember complex strategies for, or one that you have to play a certain way. It’s really hard to make a mistake at Roulette – just place a bet, and hope you get lucky.Play at this years #1 online casino for United States - Slots.LV. We’ll split this into two sections. Inside Roulette Bets, and Outside Roulette Bets. We will be using American Roulette odds to cover all of these. You may want to hit up our Roulette Flash Game while you read this, so you can try out all the different bets without any risk involved. Straight Bet: The straight bet is when you bet that the ball will land on one specific number on the next spin. The casino odds you are given on one number coming up are 35-1. So if you bet $10 on number 27 and the ball lands on 27, then you will get a return of $350. If the ball lands on any number other than 27, you will lose your initial wager. Split Bet: A split bet is when you bet that one of two numbers will come up on the next spin. These have to be two numbers that are adjacent on the layout. The payout for these bets is 17-1. So you would be betting $10 on the numbers 28 and 31 for example. If either of those numbers come up, you would get a return of $170. Trio Bet: A trio bet is betting that one of three numbers in a certain row on the roulette table layout will be the winner on the very next spin. Other names for a Trio Bet are a Street Bet and a Stream bet. The return on Trio bets are 11-1, so a bet of $10 on the trio of 10, 11 and 12 would see a return of $110 if the roulette ball lands on one of those number during the next spin. Four-Number Bet: Starting a notice a pattern? The four number bets, also known as a square bet is when you are betting that one of four numbers will hit on the next spin of the roulette wheel. All numbers must be touching on the roulette wheel layout, for example 25, 26, 28 and 29. The odds on this is 8 to 1. Five-Number Bet: A five number bet is a bit more specific than the previous bets: you are betting that one of 0, 00, 1, 2 and 3 will be the winner of the next spin. You can not choose any different set of numbers. The house odds offered on a five number bet are 6 to 1. Six-Number Bet: A six number bet is when you are betting that one of six numbers will be the winner of the next spin of the roulette wheel. The numbers have to be listed in two consecutive rows on the roulette wheel table. So for example, you are betting that 10, 11, 12, 13, 14 or 15 will be the number where the ball lands on the next spin. The payoff for the six number bet is five to one. Red or Black: When you are placing a bet on red or black at Roulette, you are betting that on the next spin, the ball will land on either a red coloured number or a black coloured number. Can’t get simpler than that. The payoff for betting on black or betting on red is one to one. Even or Odd: An even or odd bet is very similar to a red or black bet. You are betting that on the next spin of the roulette wheel, the number the ball lands on will be either even, or odd. The payout is the same – one to one payout for roulette even or odd bets. High or Low Bet: A low bet is when you are betting that on the next spin, the ball will end up landing on a number from 1 through 18. Payoffs for this bet are even money. When you are placing a high bet, you are betting that the number that the ball will land on is 19 through 36, and again the payoffs for high bets just like low bets, is even money. Column Bet: A column bet in Roulette, is when you are betting that on the next spin, a number from one column of 12 numbers will come up. The payoff for column bets are two to one, or twice your bet. For example, if you bet on the middle column, you would be placing bets that one of the following numbers would come up: 2, 5, 8, 11, 14, 17, 20, 23, 26, 29, 32, 35. Dozen Bet: When you bet a dozen bet in Roulette, you are betting that on the next spin, the winning number will be a number from one particular group of numbers. You have three choices of which “dozen” to bet on – the first dozen is numbers 1 through 12, the second dozen is 13 through 24, and the 3rd dozen is the numbers 25 through 36. Payoffs for dozen bets are two to one on your original bet. And that’s all the bets covered in the wonderful game of Roulette. Now hit up the roulette tables at Slots Jackpot Casino – they’ve got practise games and low limit games if you’re a beginner, with great roulette tutorials throughout. Click here. What roulette bets are there? What are all these roulette bets? How do I bet on Roulette?